The United States Congress designated the Wet Beaver Wilderness (map) in 1984 and it now has a total of 6,178 acres. All of this wilderness is located in Arizona and is managed by the Forest Service. Winding on a serpentine course through the rim of the Colorado Plateau, Wet Beaver Creek twists through a steep-walled canyon of Supai sandstone and shale. Beyond lovely red cliffs in the lower section, the canyon widens and opens onto the Verde River. It originates about 12 miles east of the Beaver Creek Ranger Station at an elevation of about 6,200 feet and enters the Verde near 3,000 feet. Here you'll find pristine riparian habitat dominated by cottonwoods, sycamores, and alders. 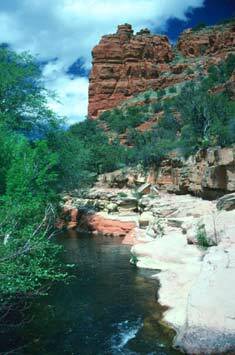 Wet Beaver Creek is one of Arizona's finest and rarest natural resources: a perennially flowing desert stream. The year-round waters attract large numbers of wildlife: elk and deer, bears and lions, smaller mammals, reptiles, and birds. Two major trails, Apache Maid (9.5 miles) and the more popular Bell (10.8 miles), offer easy access to the rim country. Down in the canyon the hiking is fairly easy. Many visitors come to picnic, hike, or fish for trout and bass. Planning to Visit the Wet Beaver Wilderness? How to follow the seven standard Leave No Trace principles differs in different parts of the country (desert vs. Rocky Mountains). Click on any of the principles listed below to learn more about how they apply in the Wet Beaver Wilderness.